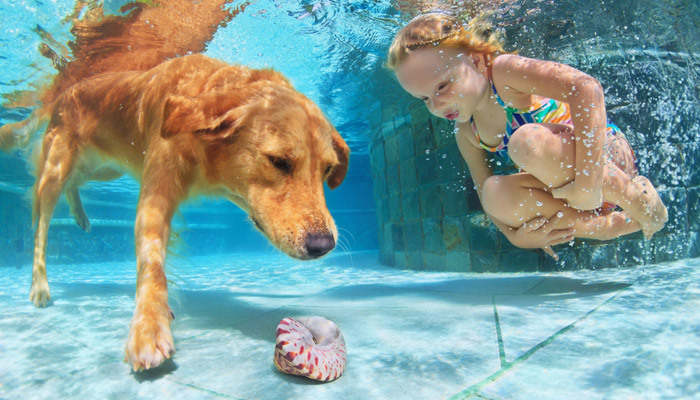 As you envision your new swimming pool, don’t forget about its surroundings! 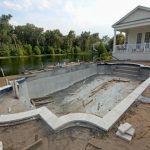 Getting a clear mental image in your mind will not only help you clearly communicate with your chosen pool installation professional, but it will keep you focused as you move toward creating the backyard of your dreams! One way to make your poolside space visually expansive is to keep the surrounding space simply landscaped, with nothing to visually disrupt the lines. 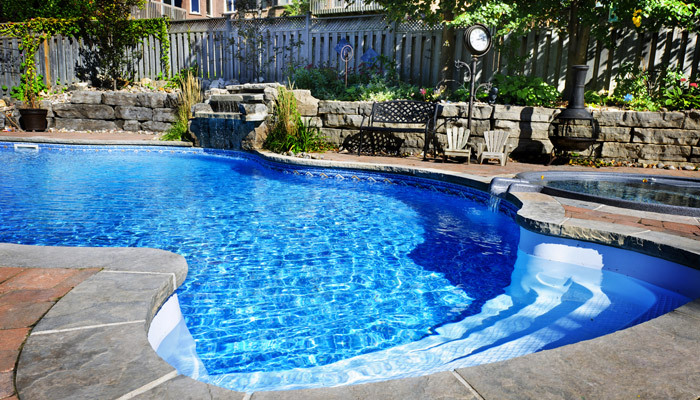 By surrounding all sides of your rectangular pool with green space, you can easily achieve a luxurious open feel. To offer patio space without raising the profile, you can opt for pavers instead of a raised wood deck. The modern vibe created by these simple, geometric designs could be reinforced by laying pavers in a grid-like pattern. As the space extends further, consider simple shrubbery such as boxwoods to continue with the angular theme. When you’re trying to decide on which material to use for your deck or patio area surrounding your new pool, think past the idea that you have to select just one! Artful combinations of stone, brick, and tropical hardwoods can create a rich yet interesting vibe. Perhaps you might want to use more than one material throughout the space or use a variety as you transition from one activity zone to another. 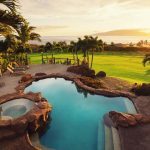 Perhaps one level of your deck could be an eating zone, while another offers space designed for lounging and yet another for more active play; of course, another level would be dedicated fully to those enjoying the pool. You may also want to incorporate both sunny spots and shaded ones. Don’t think that just because most pools you’ve seen or swam in are rectangular that yours has to be! 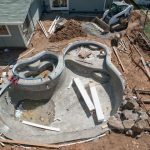 A freeform pool can make a spectacular style statement, and you can build on that theme with curved surroundings. Think randomly shaped pavers arranged into flowing designs with curvy, built-in benches. In addition to rounded shapes, you can create a unique look by selecting materials with specialty textures, such as natural stone and pavers with chiseled surfaces. When using natural materials and those with a timeworn appearance, you allow your pool area to include a warm, rustic appeal that may complement your home’s style as well as its surroundings. 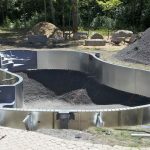 Depending on the amount of space you have available around your pool and your particular property, you might want to introduce added elements, such as a fire pit, waterfall, fountains, LED lighting, or a retaining wall. If you live in an area conducive to outdoor living space, you might also want to incorporate a flat-panel TV. Elevating the pool deck may also add to the ambiance, if doing that would offer especially great views from your poolside paradise. 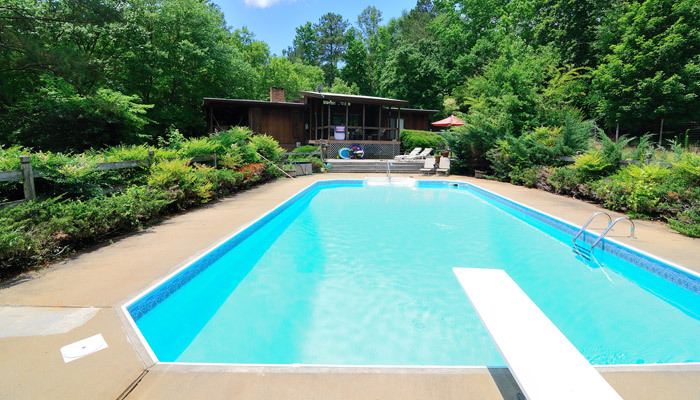 But if your home isn’t already surrounded by beautiful scenery, don’t let that keep you from imagining a pool surrounded by luscious greenery, such as crepe myrtles. If green space is limited, consider large urns filled with tropical-looking plants.